1 rain forest amazon | This Blog Rules | Why go elsewhere? What attracts people to the Amazon Rain forest is the simple beauty of it. The Amazon represents over half of the planet’s remaining rain forest and it is undoubtedly one of the most wonderful places on Earth. But what do you know about it, besides being big and amazing? Here are 10 facts you need to know about the Amazon Rain forest. The name Amazon is supposedly inspired from the Amazons described by Herodotus and Diodorus in Greek legends. The amazons were believed to be a nation of all female warriors in Greek mythology.what does this have to do with the rain forest? Well, the name is said to arise from a war between Francisco de Orellana, a Spanish explorer and conquistador known to have completed the first navigation of the Amazon River, with a tribe of Tapuyas. The women of the Tapuyas tribe fought alongside the men, as this was nothing extraordinary. Known as the River of Orellana, he later changed the name to Amazon, inspired by these warrior women. The Amazonian rain forests have unparalleled biodiversity. Believe it or not, but one in ten species in the world can be found in these rain forests, thus making the Amazon the largest collection of living plants and animal species in the world. Want to know how many plants grow within the limits on a quarter square kilometer? About 90, 790 tones of living plants, according to a study in 1999. 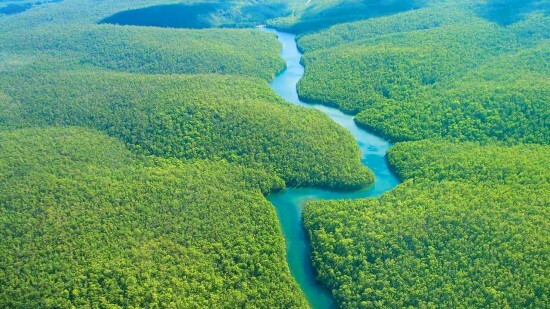 This means that the Amazonian rain forests are by far the greenest places on Earth. Afraid of piranhas? Need not worry, as they are most commonly only found in the Amazonians Water, namely in Venezuela. Piranhas have a reputation of being one of the most ferocious predators living in the water, as they hunt and prey in schools. Swimming in the Amazon is not really advisable as piranha attacks do result in death. They usually attack in the dry season when food is scarce and water levels are low. True, fatal attack are indeed rare, but why risk? Myths say that they can lacerate a human body in a matter of seconds. Sounds convincing enough? Did you know that you could fit 30.86 Eiffel Towers in the width of the Amazon river? That’s right! The breadth of the Amazon varies from 1.6 km up to 10 km going up to 48 km in the wet season. Because of its vast dimensions, it is sometimes called ‘The River Sea’. The exact location of the mouth of the river is a matter of dispute, because the geography of the area is peculiar, but still, the width can go up to 180 kilometers! Impressive, right? Another creature that hunts in the waters of the Amazon is the electric eel, which is an electric fish, the only species in its genus. It generates powerful electric shock up to 860 volts which they use for hunting, self-defense and communicating. Can it kill you? It is highly unlikely to kill and adult human, due to the very short duration of discharge. Still, death have occurred in the past so once again, think twice before swimming in these waters. Archaeologists have shown us that human inhabitants first settled in the Amazon region more than 11,200 years ago. Which, if you think of it, is amazing. The Amazon area is not so human friendly, living is impossible due to the harsh conditions: the soil is poor and agriculture is usually the prime form of sustenance. However, recent anthropological findings have shown that the region was actually densely populated, with more than 5 million inhabitants having lived in the Amazon region. Orellana noted that there was a complex civilization flourishing along the Amazon in the 1540s and it is now believed that the civilization was devastated by the spread of European diseases, such as smallpox. It comes as no surprise that the Amazon rain forest holds a myriad of cures and treatments, all deriving from the thousands of plants species it houses. More than 3,000 plants with anti-cancer properties have been discovered in the world and over 2/3 of them grow in the rain forests. These statistics are impressive, but you should also known that less than 1 percent of the plants have actually been studied. Who knows what more secrets they hold. This should be a sufficient reason for stopping deforestation, don’t you think? Studies have found that a series of square, straight and also ringlike ditches scattered all over the Amazon territory have been there since before the rain forest existed. They are supposedly human-made structures, allegedly used for defense, drainage or maybe religious reasons. This alteration of the landscape is one of the harshest ones to have ever been made. For years, archaeologists thought of indigenous people as being gentle on their landscape, altering very little of the rain forest. How could the peaceful Amazonians chop and burn down trees is still a mystery. As an explanation, presumably that the ditches have been built before the host of trees started to appear. Who knows? Did you know that all the mineral dust in the Amazon forests comes from a single spot in Sahara? About 40 million tons of dust are transported each year from the Sahara to the Amazon basin. Placed in a narrow path between two mountain chain that are responsible for the accelerated winds over the depression, the Bodele emits more than 0.7 million tons of dust per day. Without the Bodele, the Amazon rain-forests we know today, would probably not exist. By now, you should have figured that the Amazon is simply gigantic, dwarfing every other river there could be in the Amazon area. However, no earlier than 2011, a river almost as big and as wide as the Amazon was discovered by a group of Brazilian scientists and they named the river Hamza, after the head of the team . But how could it have been hidden all this time? Well, as you may be suspecting, it is nothing more than an underground river, flowing from west to east and is around the same length, of 6,000 km. what is even more impressive, is while the Amazon ranges from 1 km to 100 km in width, the Hamza ranges from 200 km to 400 km. Who knows what more secrets do the Amazonian rain forests hold?